Drug-free nanostructures—glyceryl-dilaurate nanostructured lipid carriers (GDL-NLCs)—are shown to selectively target Plasmodium-infected red blood cells and afford partial protection against malaria. Add the drugs, and they become a formidable vehicle for targeted treatment of malaria. Malaria claims more than 6,00,000 lives every year. Anti-malarial drugs currently prescribed and used for treating the disease suffer from low bioavailability, high toxicity and side effects, and are difficult to administer, necessitating the search for more effective alternatives. Researchers from the Institute of Chemical Technology (ICT), Mumbai and Tata Institute of Fundamental Research (TIFR), Mumbai designed special nanostructures for targeted delivery of anti-malarial drugs. They have since shown that surprisingly, even in the absence of drugs, these nanostructures show 70% efficacy against the disease. Their recent investigations show that the nanostructures rapidly and selectively target Plasmodium-infected red blood cells (iRBCs) and severely impair the parasite while restoring the elasticity of the iRBCs. Most anti-malarials do not dissolve readily in water. Their low solubility poses a challenge in designing formulations that can be administered intravenously. To overcome this problem, researchers from ICT, Mumbai led by Vandana B Patravale designed nanostructured lipid carriers—special nanostructures that result from a blended solid-liquid lipid mixture—containing gyceryl-dilaurate, a non-toxic plant extract found in vegetable oils that is commonly used in cosmetics. Working with Sulabha Pathak and Shobhona Sharma from TIFR, Mumbai, they tested the efficacy of drug-loaded glyceryl-dilaurate nanostructured lipid carriers (GDL-NLCs) in treating malaria in mice and attempted to understand how these carriers weaken the parasite in the absence of drugs. 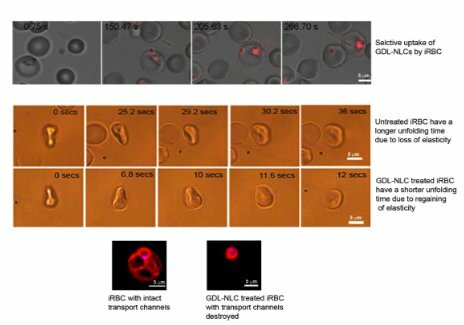 By tagging the GDL-NLCs with fluorescent dyes, they showed that in mice, iRBCs take up the nanostructures more readily compared to normal, uninfected RBCs or other types of cells. Further investigations revealed that the GDL-NLCs localized in the parasite mitochondrion, and their uptake disrupted the tubulovesicular network—a channel established by the parasite for obtaining vital nutrients. While the uptake pathway is still not known, their work sheds some light on the effect of the GDL-NLCs on the parasite. As the parasites mature in the bloodstream, infected RBCs (iRBCs) lose elasticity. This loss of flexibility could lead to blockages in the patient’s blood vessels, precipitating disease-related complications like cerebral malaria and multiple organ failure. GDL-NLC uptake by the iRBCs also has the important consequence of restoring their elasticity. “This is a very significant observation. Since the iRBCs become flexible again, many problems associated with acute malaria may be addressed,” said Shobhona Sharma, Professor at the Department of Biological Sciences, TIFR. It is suspected that the disruption of the tubulovesicular network plays a role in this dramatic decrease of the RBC rigidity caused by the parasite. Finally, the researchers studied the effectiveness of treatment by using the GDL-NLCs as carriers for two combinations of antimalarials recommended by WHO. As low as 5 to 20 percent of the currently recommended dosage was sufficient for complete parasite control and survival. “In medicine it is important to treat the disease effectively, but it is equally important not to cause any other adverse effects. Targeted treatment and lower dosages make both possible,” said Sharma. GDL-NLCs are easy and inexpensive to fabricate. With their proven ability to deliver water-insoluble drugs, their specificity in targeting infected RBCs and their antimalarial activity, GDL-NLCs promise to address many of the challenges in treating malaria.